On the 16th and 17th of November 2017, Xentians organized and participated in a fun filled CSR Mela, for a cause. Exciting games, delicious snacks, a wacky photo booth, tattoo art and complete masti filled our cafeteria on both days. We raised funds to partly sponsor 20 laptops for visually challenged students pursuing their basic and advanced computer courses at the Technical Training Institute of Pune (TTI). 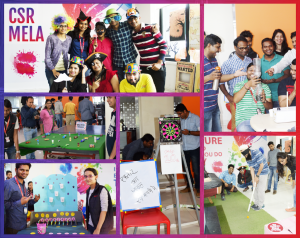 The two days displayed lot of team effort put in by the employees to set up stalls with innovative games and yummy food. Game stalls included a buzz wire loop, toss the ring, coin in a bucket, frog spoon challenge, playing golf blindfolded etc while snacks included homemade tangy, spicy savories, refreshing drinks and some sweet treats. A total of 10 stalls were set up for both days. Our catering partners, Urban Grill, also decided to contribute towards this cause and set up their own stall selling hot delicious snacks. Apart from the stalls, other attractions were also enjoyed by our Xentians which included the screening of an audio described movie and silk thread jewellery making workshop. A short film of 30 minutes was shown, which had to be watched blindfolded and enjoyed through its audio description and your imagination. The concept behind showing this movie was to create a sense of empathy for the beneficiaries for whom we were raising these funds. It was an amazing experience which definitely left our audience grateful for the gift of vision that they all have been bestowed with. The silk thread jewellery making workshop was enthusiastically attended by over 25 participants. They learned the art of making silk thread jewellery in 1 hour workshops throughout the day. They made and took home some very pretty jhumkas. All our employees participated wholeheartedly in the Mela and enjoyed thoroughly, while donating towards a cause. For every rupee contributed by an employee, Xento CSR donated an equivalent amount to this project. Entrata also joined hands to support this cause and set up a raffle draw fundraiser for their employees at the US office. Some very exciting baskets of goodies were up for grabs. Raffle coupons were sold and all the money collected was donated towards this project. The beneficiaries of these laptops are visually challenged students pursuing their computer courses. Having a personal laptop will help them pursue knowledge they have learnt from the course and utilize it towards their employment opportunities. The course offered at TTI is absolutely free of cost, including their stay and meals. Now with the help of these funds raised, we will be able to empower them for a brighter tomorrow.